So many individuals work from home these days. The question is if your home office is built for optimal comfort and productivity? If you're still working from the kitchen table and thinking about building a serious home office, Jumia share tips that will help you get it right. Once you have made your critical needs list, you have a better idea of how much room you actually need for an office. With that in mind, you can now choose a dedicated area of your home for office space. Ideally, the office should be in a quiet area with some level of privacy. This is especially important if you share the house with a spouse, children or even a roommate. If working at a computer takes up a significant chunk of the day, posture and comfort are important, so that plastic chair lying in a corner will not do the job. Choose a comfortable chair that can be adjusted to give good posture, irrespective of the table being used. Buying a workstation is not difficult. But the problem some people have is keeping your it organised. Keep all your paperwork organized and nearby so you don't have to waste time looking for a specific document. Invest in anything that keeps you organized, like a proper filing system if you have a bunch of papers. There is absolutely nothing wrong with keeping things simple. Computer, good-size monitor, fast Internet, desk, comfortable chair, phone, proper lighting and a filing system for paperwork. Depending on your needs, you may also require a fax machine, printer and copier. When possible, choose a space for your office that allows plenty of natural light. 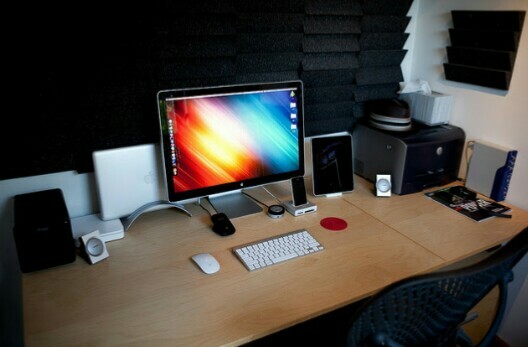 This provides a good foundation for a bright working space that can then be enhanced with more direct lighting. If this is not the case you have to provide your own lighting.